Personal Robo-Advisors are beginning to appear in retail banking. Taking advantage of rapid advances in Artificial Intelligence (AI) technologies, these software robots will be capable, in the near term, of managing more and more of the requests currently handled by bank branch and call center personnel. While the ability of robots to bring down the cost of customer relations makes their adoption inescapable, their emergence is forcing banks to already ask themselves what type of distribution and customer relations model they will have in the near future, notably via their existing and future networks of physical branches. 1/ AI will be inescapable for banking services: the example of Personal Robo-Advisors. Robo-Advisors initially appeared in the area of portfolio management. For private individuals who do not have substantial assets, they offer an accessible solution without too many barriers to entry. In this era of the convergence of Digital and Data, Robo-Advisors are an illustration of the changes taking place in the service sector, which is going to suffer what the industrial sector has already experienced with robotization. Indeed, machines are due to take on more and more importance in services by henceforth undertaking tasks that are more cognitive than mechanical. These cognitive tasks are inherent in most service professions, and more particularly, in financial services. In the near future, financial advisors will be replaced by forms of Artificial Intelligence, Robo-Advisors. They will capitalize on all the data available on a customer in order to offer them personalized responses that will take into account both their appetite for risk and their aversion to it, whilst at the same time showing themselves able to anticipate things, thanks to the predictive capabilities with which they will be equipped. Interactions with these Robo-Advisors will be as easy as with a real advisor, as can be seen with the intelligent assistants built into certain devices today (SIRI on iPhones, Echo for Amazon, Google Now.. .). In reality, these cognitive tasks house within them Machine Learning and Deep Learning algorithms that consume substantial resources and computing capacity. It is for this reason that these smart assistant embryos built into Smartphones are not run within the device itself, but via the Cloud, and this makes us think that we are already at the start of a new era. Beyond making it easier to use the mini-computers that Smartphones are, these assistants have the merit of educating users in the simple and enjoyable use of products which are actually very high-tech. No-one is in any doubt that consumers will thus become increasingly inclined to interact with a virtual financial advisor, a veritable enhanced financial assistant, who will be available at any time and capable, above all, of providing personalized responses in real time. For the banks, the advent of Robo-Advisors therefore seems inescapable, even if that does not necessarily spell the end of human involvement. Indeed, two contradictory changes are looming and will give rise to a balance between men (customers and employees) and machines. 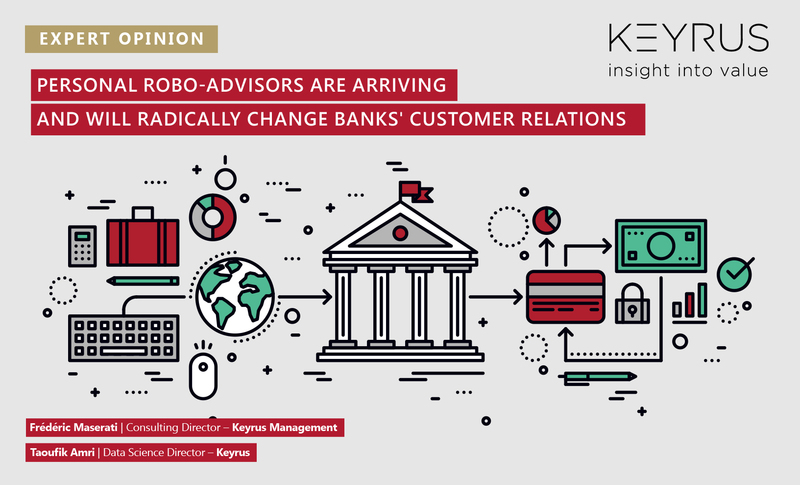 First change: Robo-Advisors will offer banks unmissable opportunities to make customer relations more fluid and improve them by delegating to machines and algorithms a significant part of the handling of requests still undertaken by branch and call center personnel. Given the multitude of cognitive applications that already exist, it is not difficult to imagine a large portion of current requests being dealt with by these Robo-Advisors, because they involve procedures that are, after all, highly systematic. This therefore represents an opportunity to optimize value chains that the banks should not miss. Second change: advances in Artificial Intelligence will allow Robo-Advisors to become more widespread in banking, but they will not completely replace man for certain tasks. Let us cite the example of PAYPAL which sensed the limits of Machine Learning in the detection of fraudulent behavior. The main conclusion of their experiences on this subject is that it is much wiser to use AI to increase man's capabilities, rather than to try to replace him. Human intelligence is capable of induction, but also of empathy, whilst machines lack these. As services undergo this transformation, Man will not disappear: he will intervene from time to time, with his input being enhanced and extended by machines. The bank of tomorrow will integrate within itself both human and artificial resources in order to valorize what is already one of its main intangible assets: Data. That Data will be processed by a multitude of channels, ranging from digital interfaces to connected objects. 2/ The short-term consequences for banks of the transformation brought about by Personal Robo-Advisors. This new stage in the digital transformation carries with it absolutely critical challenges for the major banking networks. Confronted with the squeezing of their margins, they must pay very close attention to their operating ratio, notably via their payroll. The FinTechs that have been successful – notably in the field of payment means – are not concerned by these types of problems, due to their size and highly digitalized value chains. Therein lies a fine example of the impact of Digital. In this context, the opportunities opened up by AI and Personal Robo-Advisors are decisive: these technologies represent just about the only card that traditional retail banks can play to retain their customers who have become much more autonomous, but also more demanding in terms of the quality of service and customer relations. Moreover, it is interesting to observe just how much the view of consumers regarding the use of Robo-Advisors is also changing. The latest study by AT KEARNEY on this subject is quite edifying: today, nearly 20% of consumers in the United States are willing to use Services from Robo-Advisors in the management of their daily lives. Even though today only around ten major banks offer such services based on Artificial Intelligence bricks, and only just under 3% of consumers use robots for their banking services, nearly 48% of them think that these services will tomorrow become inevitable, and almost 69% of them consider that robots will be inescapable in asset management. Reinforce the human assistance provided to premium customers and those who contribute the most to the Bank's Net Banking Income, with the use of Artificial Intelligence systems allowing account managers to deliver advice that has greater added value, whilst at the same time delegating low-value management tasks to the robots. In this way, it will be possible to generate greater customer interest and loyalty on the back of high-expertise services. On this last point, let us note the initiative by UBS, which is currently testing the use of facial recognition to assess their clients' patterns of behavior with regard to their investment strategies. This is a radical way of associating this technology with the use of a robot, who will tomorrow be capable of mesuring a customer's emotional state during a transaction. Given the far-reaching consequences that we have just mentioned, the fundamental question is obviously not to determine what is the best AI technology. To grasp the full implications of this new disruption, banks must begin by envisaging their future with AI and robots, and must project themselves into the short- and medium-term future, working from a very concrete postulate: what will be the impact of the use of robots on my distribution policy, and what will that bring about with regard to my relational strategy with my customers? The strategic exercise, working from the starting point of this future theoretical situation, thus consists of counting back down in time, year by year, to know what has to be done to prepare the solutions for this seemingly inevitable scenario. Each stage of this "countdown" thought process forces the banks to clarify the strategies to be put in place relating to their distribution, organization, and employee training, so as to support this digital transformation by the greatest number. When we try to answer this type of question, we quickly realize that the physical branches are not necessarily all going to disappear for all that, provided that the bank uses them to deliver other offerings and services. It is this type of forward-looking scenario that is woefully lacking in the banking sector today. Indeed, we are witnessing the redefining of traditional banking jobs in the light of new technologies, but what we are not seeing are new jobs, made possible through new technological transformations, being defined. According to Peter Drucker, "the best way to predict the future is to create it". This is precisely what banks must do today. They must create their future by redefining their vision and, in the process, and in this era of all-pervading Digital and the AI "revolution", redesign their models, organizations, and offerings, before other players, or even start-ups, with more experience in these areas "uberize" the sector and turn themselves into key players in it. Frédéric Maserati holds an MBA (from ESSEC). He has occupied several operational positions in Marketing and e-Business working for major banking groups. Today, he is developing several offerings around the Blockchain, Crypto-currencies, the commerce of tomorrow, and the bank of the future (with new approaches around Artificial Intelligence). He is increasingly interested in the impact of exponential technologies (NBIC) on new models. Taoufik Amri is a graduate of the French Ecole normale supérieure and a doctor in quantum physics. He began his career developing quantitative models in banking, market finance, and insurance. Within Keyrus, he heads up the Data Science Business Unit, which works with the banking, finance, and insurance sectors. Machine Learning: in English we talk of Machine Learning and in French, of automatic learning or statistical learning. Machine Learning, as it is commonly known, is in reality a subfield of artificial intelligence which, using complex mathematical algorithms, allows a machine to fulfill difficult or problematic tasks by equipping the machine with learning capabilities, in such a way that processes do not necessarily or strictly repeat themselves, thereby enabling the machine to gain in "processing efficiency". Deep Learning: One talks of Deep Learning as an advanced field of Machine Learning. Beyond the complex algorithms of Machine Learning, Deep Learning refers to complex architectures (non-linear or neuronal in certain cases) that allow us to move yet further forward in artificial intelligence's capabilities. These architectures now make it possible to give meaning to data in the form of images, sounds and text, which the machine can itself interpret. Put another way, Deep Learning gives the machine the ability to see, hear, and thus interact with human beings. Peter Thiel, "Zero to One: Notes on Startups, or How to Build the Future", Crown Business (September 16th, 2014). The Induction Capabilities of human intelligence: we talk of induction as a way of reasoning that consists of taking several specific cases and drawing from them a general conclusion. The inductive process is therefore precisely the reverse of the deductive process. The first takes us up from knowledge of specific facts to knowledge of general principles, whilst the second takes us down from the general level to the specific one.